Which of these leadership styles is the best? 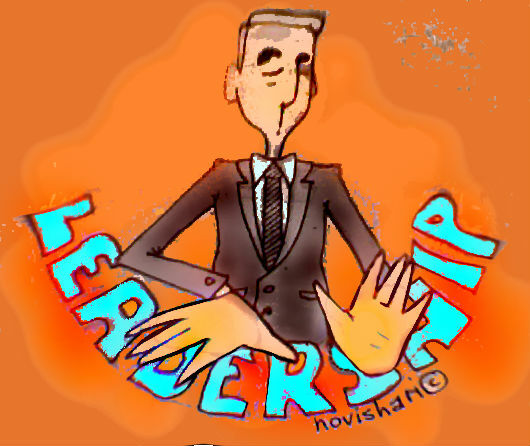 Each of these leadership styles can be extremely effective. Equally, they can all turn out to be disastrous if the manager doesn’t have the flexibility to change his approach from one situation to the other, from one colleague to another. This is the underlying idea of the Situational Leadership model created by Paul Hersey and Ken Blanchard http://en.wikipedia.org/wiki/Situational_leadership_theory. A good leader must be able change his leadership style and always use the one that best fits a given colleague’s skills and motivation. Telling/directing: This style can be characterised by a lot of communication related to the task (directive behaviour such as giving instructions, explaining, stating expectations, etc.) and a relatively small amount of supportive behaviour (such as giving encouragement, positive feedback, etc.). In short, a leader with this style mostly focuses on the task at hand and doesn’t devote much energy to offering emotional support. Coaching: The coaching style involves a high level of task-oriented behaviour as well as a high level of supportive behaviour. The leader spends a lot of their time discussing the task at hand, but they also try to increase the employee’s motivation with plenty of emotional support. Supporting: The third leadership style mainly focuses on motivation and supportive behaviour. In the communication between manager and employee there is much less emphasis on how to solve the actual problem: directive behaviour is at a lower level. 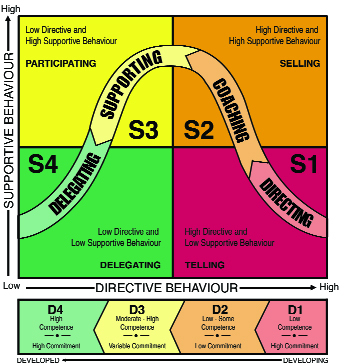 Delegating: The manager’s directive and supportive behaviour are both at a low level. A leader using this style basically lets his colleague do his job on their own. In this figure you can see the summary of the four basic leadership styles. Which style should be used in what situation? Those managers who have come across this model might remember that it depends somehow on the competence and the level of motivation of the colleague. Imagine that you are about to teach a child how to ride a bike. He has never ridden a bike before and he is naturally eager to try. He can’t wait to sit on the bike. What “leadership style” would be appropriate in this situation? Would you delegate? “I trust you, son. Just do it. I will be sitting over there on the bench…” Probably not a good idea at this stage. Would you support or coach using plenty of encouragement? “Come on, you can do it. I know you can do it, you just need to trust yourself…” Well, not really. The child is keen and motivated. He probably doesn’t need that much emotional support. Beginners are often motivated and eager. What they are lacking is the knowledge and the skills that are necessary for completing the task successfully. As a manager the best way to support novices is to give them lots of directions. In short: they need to be led by Telling. This is a difficult period for a “leader”, because motivation and knowledge are both lacking. He still needs task-oriented communication: he still needs to be told how to do the pedalling. But he also needs plenty of encouragement too. A Coaching leadership style is in order. After the naive enthusiasm of the beginner is beginning to fade, following those first mistakes there is usually a difficult period when skills are still lacking and motivation is down. The difficulty of the new job is dawning on your colleague. “Will I ever be able to learn this?” they might be wondering to themselves (even if they seem confident on the outside). The best way to help the disillusioned learner through this rough period is by applying a Coaching leadership style: emotional support and task-oriented guidance are both necessary at this stage. Somewhat later your child has figured out how to ride a bike. He is pedalling well, holding the handlebars, looking up, shouting all the way: “Hold me, hold me, don’t let go!” He clearly has the skills for riding the bike. As far as skills and knowledge are concerned he is ready. But he is not confident enough to do it on his own. He doesn’t believe in himself yet. The best way to help at this stage is to stop giving instructions and try to increase the child’s confidence. You might want to give lots of encouragement such as: “You can do it, look how well you are pedalling on your own…” Or you might even let go gently to prove to him that he can do it on his own. This is what we call a Supporting leadership style. After a while your colleague will reach the stage when they do the new job pretty well. In fact, they could probably do it on their own, if they had the confidence to try. The job of a leader now is to increase their confidence. This should be done by gradually withdrawing the task-oriented, directive communication and focusing on the supportive side. This is a critical shift for a manager; consciously refraining from giving directions, instructions and advice is never easy. But this Supportive leadership style is absolutely necessary if we want our employee to reach the confidence they need for the next level of maturity. Finally our child has reached the last stage of development. He can ride a bike and he is confident. What should a parent do? Well, probably this is the point when you can say: “Just do it, I will be sitting over there on the bench…” In other words: Delegate. At the workplace the same thing should happen when our colleague is capable, confident and motivated. As a manager resist the temptation to get involved or to give unsolicited advice. They don’t need that anymore. Just let them do it on their own. Delegate. My advice is: let go as early as possible. Of course it is difficult to find the point when you can let the child go on his own. What if something goes wrong? What he falls? Yes, he will fall at some point. But this shouldn’t stop you from moving from Telling and Coaching styles to Supporting and Delegating as quickly as you can. Because a child will never learn to ride without being given the chance to go on his own. And neither will any subordinate of yours. Remember this the next time you micromanage a senior colleague.